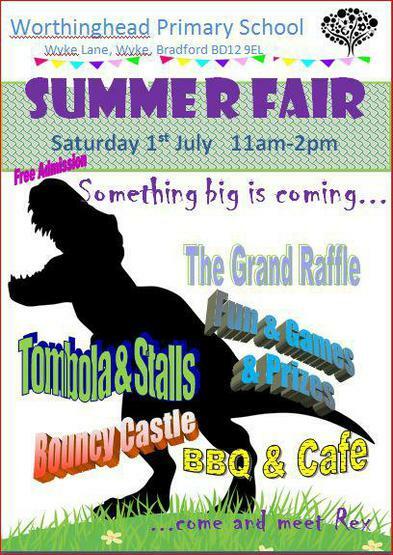 Our annual Summer Fair will take place on Saturday 1st July this year. It is our popular community event where everyone is welcome to come and enjoy the fun along with their family, friends and neighbours and it's free admission. The star attraction this year is T-Rex. It's going to be roarsome! Don't miss it! There will be the annual Grand Raffle draw with £100 first prize and many other great prizes donated by local businesses. We will have all the usual fun of the fair games and stalls including the popular chocolate tombola, and the even more popular teacher in the stocks! There will be pony rides, bouncy castle, BBQ, cafe and hopefully lots of sunshine.